Some nursery managers are selling the cheap quality plants to the buyers in the name of quality plants.The situation is unlikely to find out that they are cheating in the purchase of plants.This is beneficial to some merchants.The nurseries have their own facilities. The nurseries are sold out from other parts of the region like Kadiyam, AP and other areas. This makes them the original plant. The original truth lasts for 4-6 years after the purchase of plants. The situation has already taken place. Farmers' plants are made up of a large garden. If you carry the bangkipalli plant that fruit is not visible. Dasheri is kind of a different type. There are some kind of short hair. This is a daily walk in nurseries. There is no nursery law to prevent these irregularities, but it does not work except in paper. There are hundreds of nurseries in Khammam and Bhadrachalam new districts. There are only about 40 nurseries in both districts in the Regions. The nursery law is subject to execution or degradation. Only the lowest nurseries in the district are Sayan block. There are about 600 nurseries in two districts. There are other flower plants, coconut and fruit plant nurseries. Mango needs expert grappler to grab. They did not get it. However, some nursery owners are giving the contracting contamination contract. 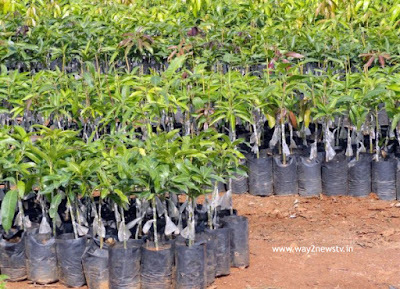 Grafters should be collected and grafted to pull the pulses needed to mango mango seedlings. He is responsible for such infection. This will give him a reward. The owner of the nursery does not know if the contracts are so far from where the cyan screws are needed to be grafted. Unknown status is the fact that cyan is brought from the plant. This is a quality plant they produce. The coconut plants do not hybrid in the original Telangana. Government coconut nurseries do not happen. Yet the hybrid is being sold as coconuts. The coconut picks are selected for the coconut tree selected for high hybridization and they are pumped in different biscuits with different honeycombs in the special bags and are selected for three days of pollen. This is called hybrid plant. In the same way, they are collected directly from the tree and sold in hybrid coconut plants. As far as the truth is concerned the farmers will be damaged. The plants are exported to Rayalaseema, Maharashtra, Odisha, Chhattisgarh, Uttar Pradesh, Assam, West Bengal, Gujarat and Bihar, along with Telangana from Telangana. Here the mango plant is sold at a maximum of Rs. 35 to a maximum of Rs. 300. Plants sold for Rs. 35 are sold at Rs 70 in other areas. With the sale of this kind, they are lobbied by other states. Some farmers have suffered such losses in the Ashwaroopete zone.